Some days are just meant to be spent at Sea. This was one of them. 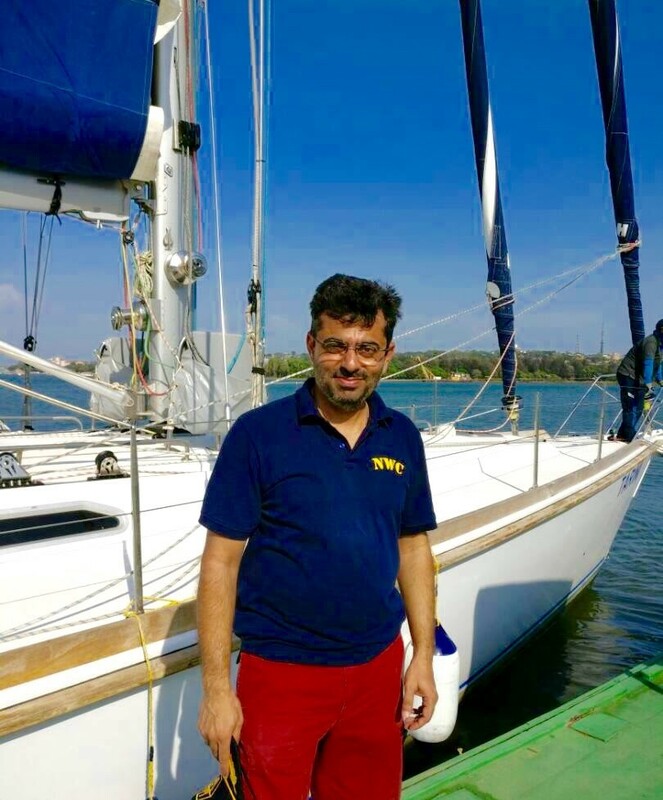 As a bunch of us set sail from the Indian Navy’s Ocean Sailing Node (OSN) at Mandovi, Goa on Mhadei and Tarini, the only thing on my mind was pleasure. The roar of the waves hitting the shore, orders from the skipper, running of ropes along cleats, rustling of sails as they caught a whiff of breeze and the appearance of a wake made for a familiar set of sounds and sights as the boat bobbed a bit, as if being welcomed by a playful river having sighted its playmate after a long anticipated wait. As the boats navigated the channel, they picked up speed and by the time we were at the river mouth, both were doing a cheeky 12 knots, throwing caution to the winds. Aah! How I wish life could always be this way. Well, as it turned out, this sail taught me a few things about life no amount of reading could. Between the two, Mhadei is the heavier boat and thus, is slower off the blocks. While we were in protected waters, both boats were stable with Tarini taking the lead as it sped towards the river mouth with Mhadei labouring her way through. The moment the waters got a bit choppy, the lighter Tarini started to pitch and roll throwing its unsuspecting occupants all over its innards. Mhadei, on the other hand, dug in and rode the waves with aplomb. Many a time in life, I have seen people who are clear winners in fair weather, crumbling in the face of the slightest challenge. True character, or the lack of it, is revealed only in the face of adversity. So do not fret my friend at someone taking an early lead. The tide will change and present to you an ocean of opportunities. Bide your time and build character. Tough times don’t last forever. Tough men (and women) do. Speed is a good thing, but….. The winds had picked up the moment we turned South. The boats were now heeling with the sheer velocity of the winds gusting sometimes to 35 knots. We were clocking an impressive 13 knots on Mhadei but that paled in comparison to the 22 knots notched up by Tarini. However, I could see that she was heeling at least 15 degrees with the crew struggling to keep her on even keel. Its that much more difficult to handle a lighter boat in strong winds than a heavier one. That’s the price you pay for the speed. There are times in everyone’s lives when one hits the sweet spot and starts to clip. Its thrilling when success kisses your feet. Its a heavenly feeling. However, those are also times when we are most vulnerable. Just like Tarini, handling this phase of our lives requires great caution. Its here that we need to keep ourselves on even keel and tread with caution, steering clear of all temptations. Its scary to see how many talented people have fallen prey to such times and ruined their lives. Greed, hubris and unbridled ambition are just some of the pitfalls that one needs to be careful about. At that speed, even a small slip up can capsize the boat and drown you. Its never a straight line…..
We had decided to race against each other. Despite the fact that Mhadei was a lot heavier, I set a challenge to my team. We had to beat Tarini. It was difficult but not impossible. As an experienced yachtsman would tell you, sailing is never a straight line affair and one has to sometimes go as much as sixty degrees off the intended direction to make speed. However, if one loses sight of the finish line, one could work up a feverish speed but would never finish the race. When success hits us, the pace is breathtaking and we often get lulled by it often losing sight of what our intended direction was. Its hard to see the destination, consumed by the seduction success offers. Life’s winners are those who never lose their direction. Fast or slow, life is constant movement. Its what direction you choose and keep that matters. When we were packing supplies and essentials for the trip, I was very careful not to carry more than necessary. Its always a battle between the minimalist me and my cautious other. After all, one does need to cater for contingencies. On this occasion, the cautious me had won. I had a crew which was inexperienced and were in the process of getting their sea legs. I decided to carry more than my usual. As we started to race, I could feel the extras weighing the boat down. I was already on a heavier boat and the extra weight would leave me no room to win. I waited a while and tried every trick I knew to compensate for the extra weight. I could clearly see Mhadei losing the battle. I took a gamble and jettisoned what I thought was unnecessary. It was a short sail and I could take a calculated risk. This immediately paid off and we gained a crucial knot or so in speed. As we go about our lives, we collect a lot of baggage. Hurts, disappointments, failures, losses and so much more. Ruminating about them can weigh us down. Take a conscious decision and jettison baggage regularly. ‘Oh its easier said than done’, that’s the usual quip I hear from people when they are asked to lighten their load. I agree. Jettisoning doesn’t necessarily equal forgetting. It essentially means accepting them as inevitable and moving on. One must take time to deal with these issues and not brush them under the carpet. Start with the smaller ones. Its hard at first but becomes easier as you practice. We were favourably placed vis-a-vis the other boat. Despite the handicap of having the heavier one, we had used the winds to our advantage. As we cruised along, I noticed it was getting close to sunset. It struck me that I had a novice crew and they were ill equipped to handle whatever the Seas might throw at us in the dark hours. I wanted to double check everything before the sun set. As I was about to ask for a check on instruments and navigational aids, I heard the power trip and the boat was engulfed in complete darkness. In all probability, the generator onboard had tripped. On another day with an experienced crew, this would hardly be a bother. However, with a bunch of greenhorns, it was different. My biggest worry was determining position in the absence of the GPS. There were a number of wrecks and navigational dangers along our route and without a positional update, we could have been heading straight for one. The only way to determine our position was to examine the generator and repair it, if possible which meant we would have to stop or at least slow down as I couldn’t trust the steering to any one of the inexperienced crew. Stopping would make us lose ground gained so far and ensure victory for the other boat. The temptation was to continue. We were at an enviable 16 knots and cruising along well. However, we weren’t sure of our position and therefore the Course to steer. I decided to stop. Sometimes, life presents us with similar circumstances. Numbed by the sheer pace of our lives, we lose reference. We become slaves to routine which robs our lives of any spontaneity and/ or fun. Life seems a drudgery but stopping doesn’t seem like an option. Fear of losing keeps us going but we don’t know where. Its in such times that we must pause and take stock. It is often tempting to carry on. After all, the momentum is exhilarating. Pausing can actually accelerate you towards your destination. Once you know where you are, you have a far better chance of knowing what to do and where to head in order to reach your goal. As we turned into the wind for our final leg, a thought crossed my mind. Were we in the lead? I am sure its crossing your mind as well. Aren’t you curious to know which of the boats won. Who do you think won? I would love to hear from you…..